Pop your smartphone into this handy projector to magnify and amplify videos, photos, or text for all to see. Watching the neighbors' vacation slides on the walls of their wood paneled basement just got a high tech upgrade. 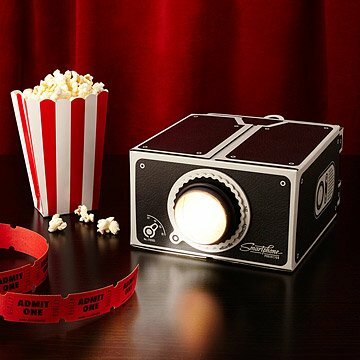 This retro projector accommodates any phone up to 3 x 5.5 inches and displays your videos, photos, or text on the wall for all to see. Simply slide the back compartment in and out to focus the image, then let the glass lens do its magnifying work--without the need to connect to a power source. The easy-to-assemble corrugated cardboard structure offers two slots for speakers or a phone charger, so you won't run out of juice halfway through that YouTube cat marathon. Assembly requires adhesive (not included). Not recommended for use with iPhone 6 Plus. All other smartphones are compatible. Click here to see Smartphone Projector FAQs. I would never buy this product again!!! Saw this in flyer, bought for 15 yr old niece. She us in to all iPhone accessories. She absolutely loves it !! McDonald's has a happy meal version, not as high quality (of course). We are planning a family get together for an outdoor, bonfire movie night. Perfect gift for my tech loving nephew! just doesn't work well. the image is blurry and too dark to see. It is bigger than I thought it would be and the projection is good quality. Very easy to use. My friend enjoys it a lot and uses it for Netflix. I purchased this for my son because he likes to watch Youtube shows on his phone. It was very easy to put together. The instructions called for super glue, but I used a hot glue gun and that worked fine. My only issue is that the projection wasn't very bright, even at night in a dark room. It only uses the light from the phone's screen. They included some app info that may increase your phone's brightness, so that may help. I had my phone as bright as my settings could go but the picture was still pretty dim. We had 3 engineers spend over 2 hours trying to get this product to work. We tried several iterations of mirror placement, etc, but nothing worked. Sadly, we have returned the item. Very sturdy, but picture quality is poor. We could not get a clear picture or one bright enough to see what we were trying to watch. My son thinks it's really cool. They record their band jamming and play back their home videos.